Whether her plan was to simply cool down on a hot summer's day or her detour happened to be more on the accidental side, one thing was certain - a young opossum suddenly found herself in a dangerous situation that nearly cost her life. 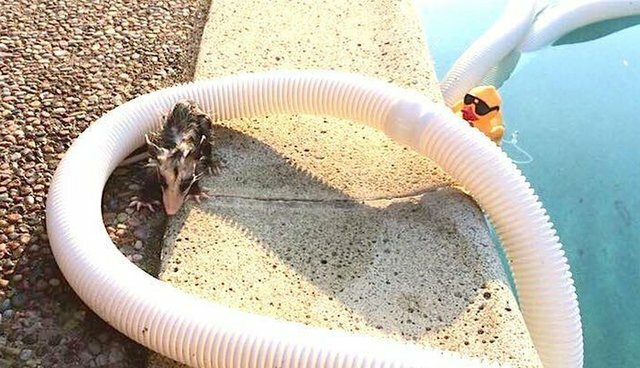 On Wednesday morning, the opossum was scooped out of someone's pool after spending the night holding onto a pool hose - the one thing that kept her from sinking. "She would of likely drowned if she was not discovered by the pool owner," Sonoma County Wildlife Rescue, based in Petaluma, California, wrote on Facebook. The opossum's rescuer brought her to the wildlife rescue in a box to make sure she got the help she needed after facing such a scary ordeal. According to the rescue, the opossum was cold, wet and very scared. In a video clip the group shared, the opossum shivered as she held on tightly to the gloved hand of one of her rescuers. She was immediately placed on a heating pad to help warm her up. "She is already paired with another baby the same size," the rescue wrote in a Facebook comment. "She will stay in our wildlife nursery until they get a little bigger. Then they will go outside into our wildlife community and learn how to survive in the wild. Then the best part, she will be released." Luckily for this opossum, she managed to survive through a tough situation - and now not only does she get a friend, but a chance to return to where she belongs, thanks to the kindness of the Good Samaritan who found her and placed her in the best hands possible. Want to help Sonoma County Wildlife Rescue continue doing good work for animals in need? Consider making a donation here.